Merry Christmas! I love the holiday season. We have had a full ministry this Christmas season with a two night Christmas Cantata, a Children's Christmas Program, the choir singing at the mall, and now we focus on our Christmas Sunday this weekend, with a special message from our Pastor (Pastor Randy Starr). This would be like a special "Christmas push" to invite friends and family to church (especially because Christmas falls on a Sunday!). Marcia, W.T. and I will be traveling to Ohio to see the "great Grandmas" and others also. I am still debating about going to Michigan to meet up with Pastor Chris for a book hunter's dream (Grand Rapids: Baker, Zondervan, Eerdsman, Kregel, etc.). I am already worried about how I am going to handle my library of books when I go to the mission field, and a trip to MI isn't going to help, but then again, there are a few books on my wishlist that need attention. I will need wisdom on that, for real! I do look forward to a hiatus from "blogdom" during the holiday season. I will at least get to Matt. 5:3-6 done today, since it is already written out, I just need to cut and paste it, and the same with finishing up on the "Holy Spirit in Acts." 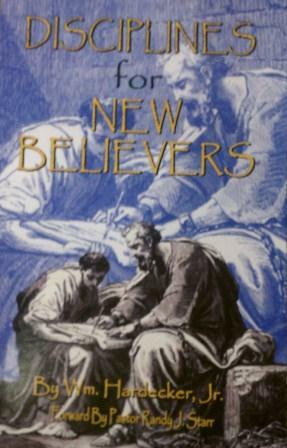 "Disciplines for New Believers" ($6.00 + s&h) is now available in the paperback format besides the Kindle format. 1. You can email me a request at "hardecker-at-gmail.com." 2. You can tweet me a request @hardecker. 3. You can phone in an order: 717.880.5011. 5. You can purchase the book at the Starr Publications website.